Det. Brian Simonsen, 42, died in a "tragic case of friendly fire," NYPD Commissioner James O'Neill said. 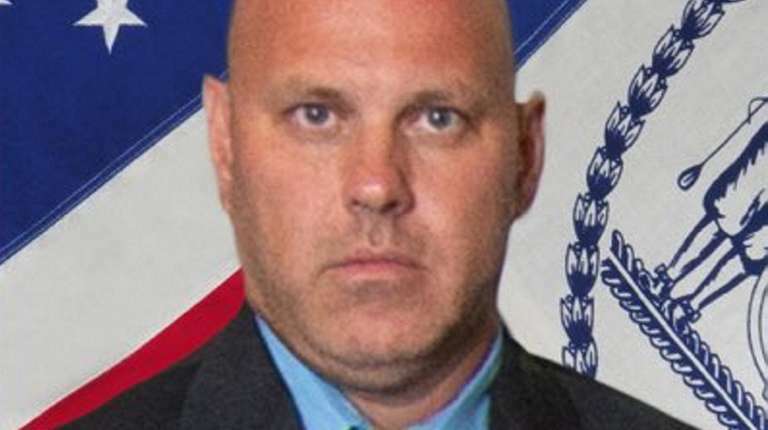 An NYPD detective was fatally shot and a sergeant was injured Tuesday night in what Commissioner James O'Neill described as a "tragic case of friendly fire" while responding to an armed robbery in Queens. Det. Brian Simonsen, 42, of Long Island, was shot in the chest and the sergeant, Matthew Gorman, was hit in the leg, O'Neill said. Both were taken to Jamaica Hospital Medical Center, where Simonsen was pronounced dead and Gorman was listed in stable condition. "Our hearts are broken in New York City and in the NYPD," O'Neill said during a news conference Tuesday night. "Make no mistake about it, friendly fire aside, it was because of the actions of this suspect that Det. Simonsen is dead." 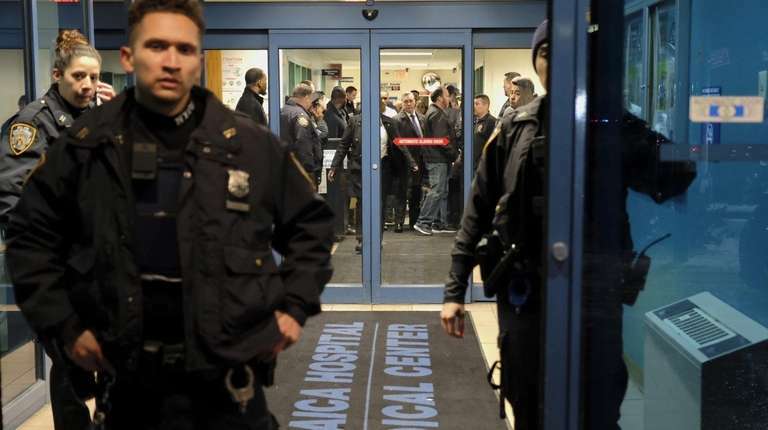 The suspect, identified by a law enforcement official as Christopher Ransom, 27, also was shot multiple times and taken to NewYork–Presbyterian/Queens hospital in Flushing in stable condition, O'Neill said. Ransom is a "career criminal," who has previously been arrested for grand larceny, criminal impersonation of a police officer and fraud, police said. The officers were responding to a reported robbery at a T-Mobile store near Atlantic Avenue and 120th Street in Richmond Hill when the shooting happened just before 6:15 p.m., according to O'Neill. At least one 911 caller said two workers had been forced at gunpoint to the back of the store, according to O'Neill. Simonsen, a 19-year veteran of the NYPD, and Gorman happened to be in the area working on an unrelated case when the call came over the radio. They arrived around the same time as other officers. Ransom then came from the back of the store and pointed what appeared to be a gun at the officers, O'Neill said. Multiple officers fired multiple rounds, one of them striking Simonsen, he said. An imitation firearm was recovered by police at the scene. Mayor Bill de Blasio and O'Neill met with Simonsen's grieving wife and mother as well as the injured sergeant, who has been with the department for more than eight years. "It was absolutely heartbreaking. The shock that they’re feeling was so painful to see," de Blasio said of Simonsen's family during the news conference at Jamaica hospital. When he went outside, he said, "all of a sudden there were cops all over." Michael Palladino, president of the Detectives' Endowment Association, said Simonsen was the elected delegate of the 102nd Precinct detectives' squad and wasn't supposed to be working Tuesday night. "His fellow detectives, they saw leadership skills in him. He was the kind of fellow that led by example, not by words," Palladino said at the hospital news conference. "He didn't have to be at work tonight because . . . today was the delegates meeting this morning, he was actually excused from duty, but we had this pattern going, and he felt compelled to go to the delegates meeting, ignore the excusal and go to work." O'Neill called Simonsen's death "an absolute tragedy." "The sympathies and prayers of the entire New York City Police Department are with the family and colleagues of Det. Simonsen," he added. Elected officials, including Sen. Chuck Schumer and City Council Speaker Corey Johnson, took to Twitter to offer their condolences. "Praying for these two officers and their families," Johnson said. "We are forever indebted to the brave NYPD detective who was killed in Queens tonight and the sergeant who was wounded. May God bless them and their families," said Schumer. The last NYPD officer fatally shot in the line of duty was Miosotis Familia. The 12-year veteran and mother of three was gunned down as she sat in an NYPD mobile command vehicle in Fordham Heights, the Bronx, on July 5, 2017. The suspected gunman, Alexander Bonds, was killed by responding officers after he brandished a revolver. NYPD Det. Brian Simonsen known as 'Smiles'"He could make friends with perfect strangers ... Everybody knows Smiles."